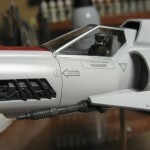 I finished off the Viper build last Thursday. She competed in MosquitoCon 21 on Saturday and took a Second Place trophy in her category. Now I’m in the process of trying to figure out how to pack this thing up so that it’ll ship to Florida in one piece! Glad to have this complete. Really happy with how it turned out. Almost sad to have to ship her off. 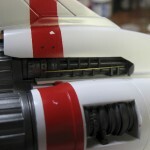 This will be my final update post on the Colonial Viper MKII. 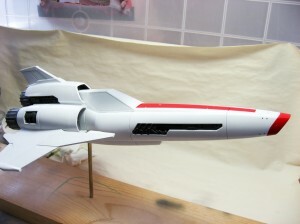 The next photos will be of her completed. 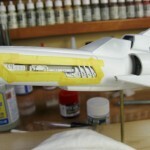 But for now, here are a few photos of the weathering process. 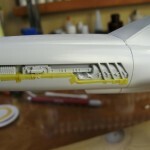 I’m only going to show the forward avionics bays to illustrate this, as there’s more going on in that section, detail-wise, than in the engines, and because I’m close enough to the end that I don’t want to show overall shots of her until completely finished. 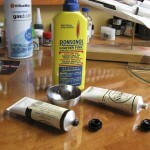 For washes I still like to use artists oils. 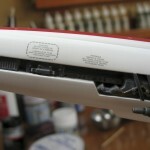 I have, however, gotten away from using mineral spirits for thinner, and instead I use lighter fluid. 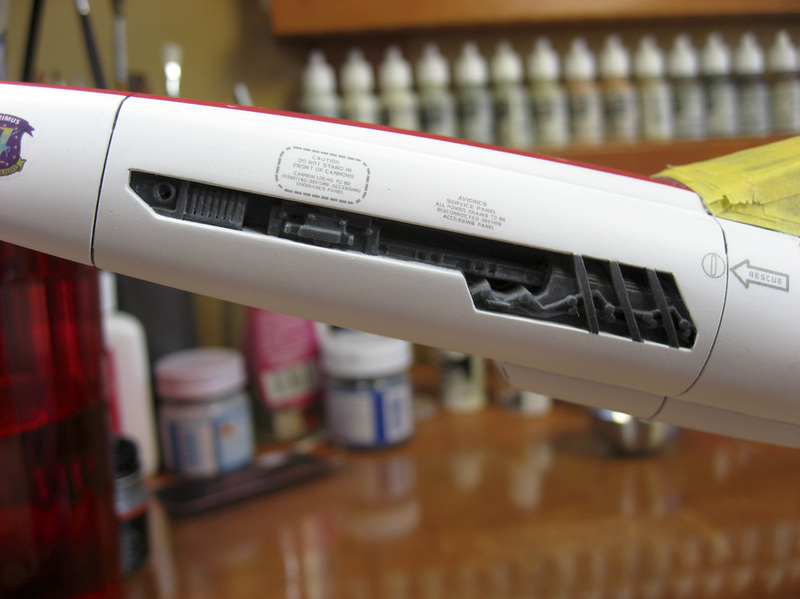 It works just as well, but dries much faster. 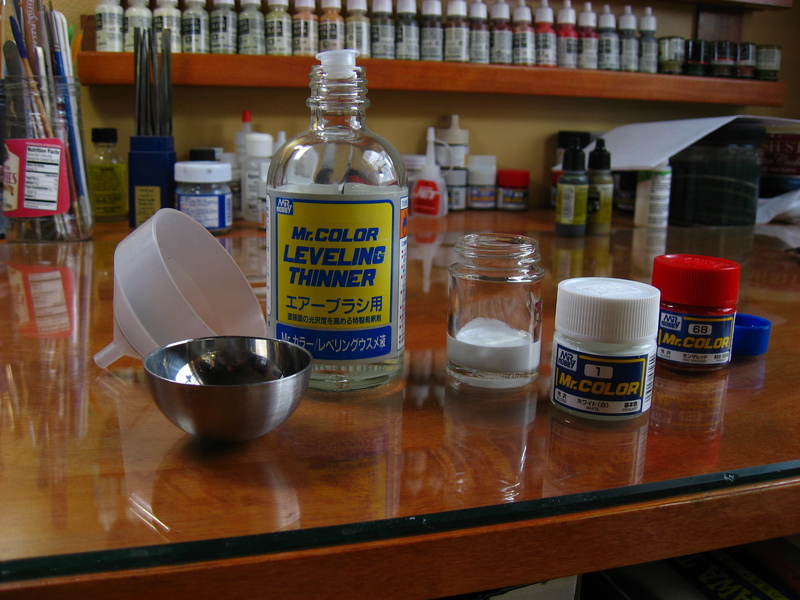 Using lighter fluid (naptha) allows the oils to dry in just a couple of days, instead of taking nearly a week. 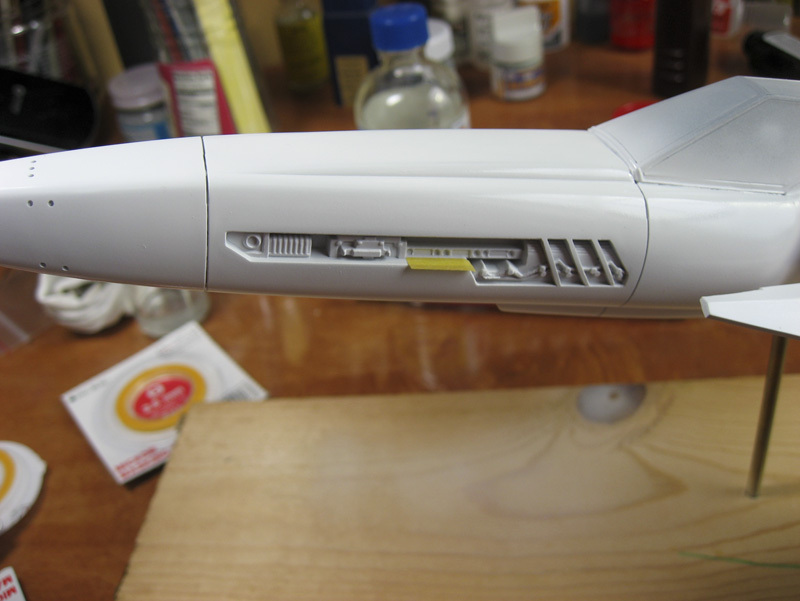 I did a general wash of the avionics bays, let that dry, and dullcoated everything. 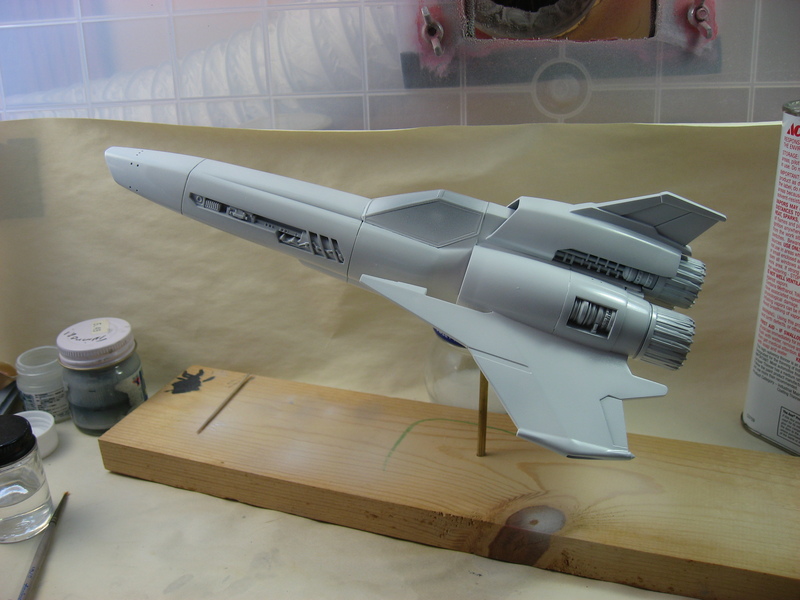 I then used acrylic bronze paint for some details, and once that dried I picked out further points of interest using a silver pencil. 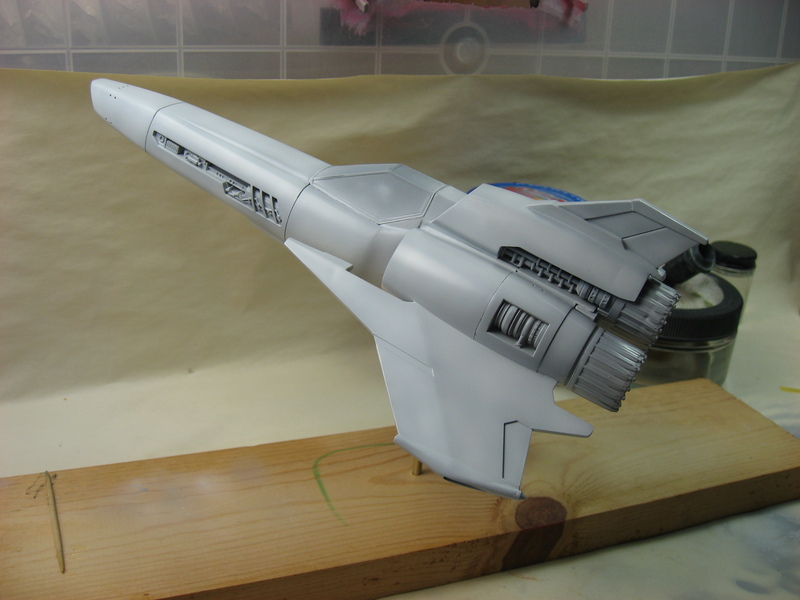 The next step is pastel chalk and weathering powders to dirty her up a bit, and some airbrushing of pure flat black for blast marks, engine residue, and gun smoke. That’s it. The journey is nearly over. 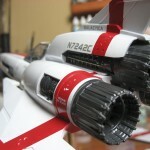 Our yearly club show, MosquitoCon, is next Saturday, and the Viper will be on the contest table. 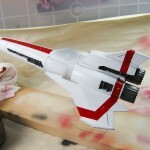 After that, she gets packed up and shipped to her new owner. 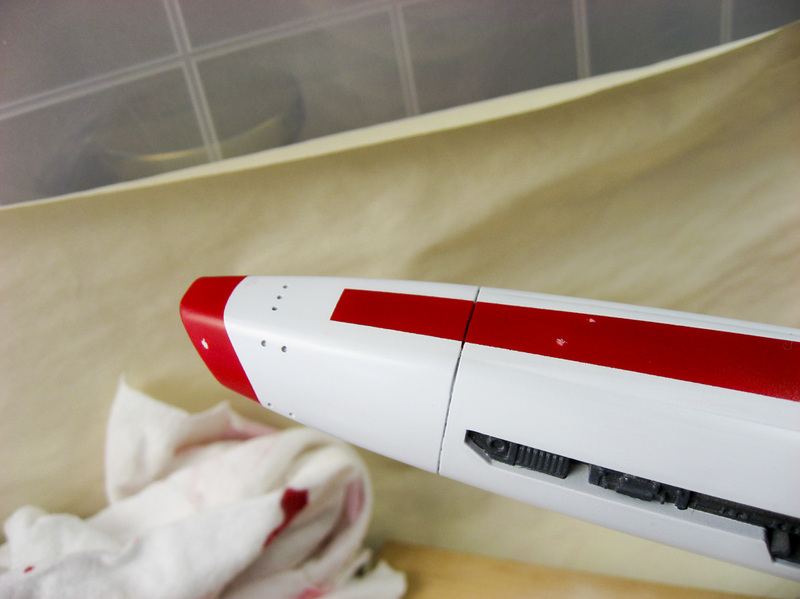 Photos of decals applied (the guns in the shots are crooked as they’re just stuck on to see how they look, they’ll be straight once glued on). 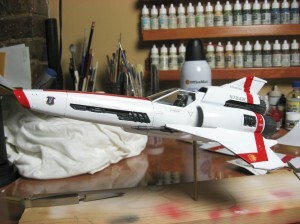 I used the kit decals for the smaller markings and the squadron badge. 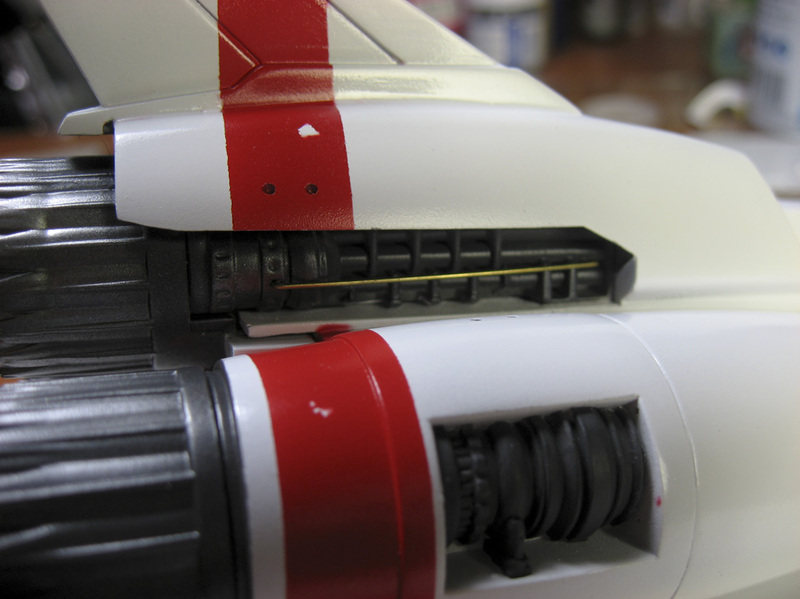 The kit supplies both red stripes with the insignia included, or just the yellow insignia if you want to paint your own stripes. 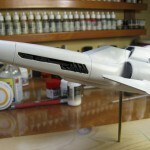 The only problem was that they were so translucent that they didn’t show up at all once applied! 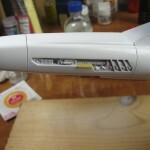 Fortunately I also purchased an aftermarket decal sheet to get the tail code number and nameplate for Admiral Adama’s bird during the first Cylon War. Those insignia worked just fine. 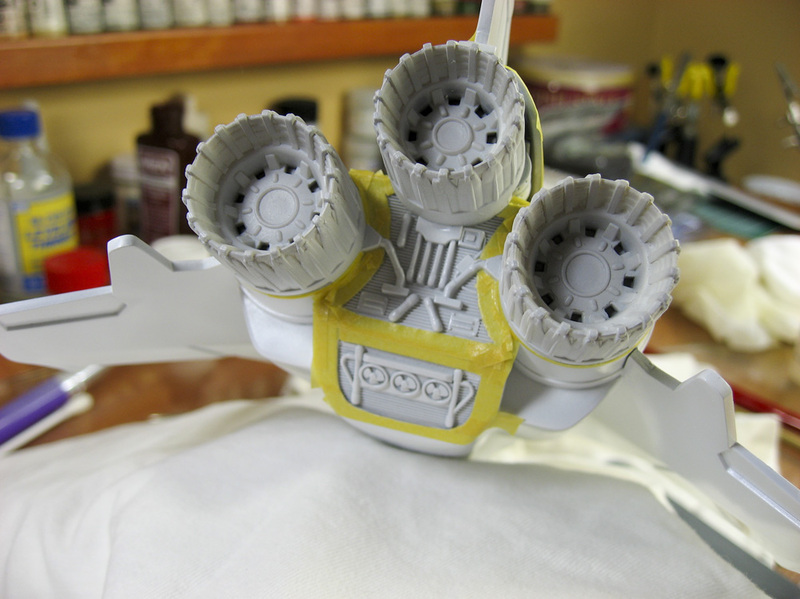 I also removed the canopy masks. 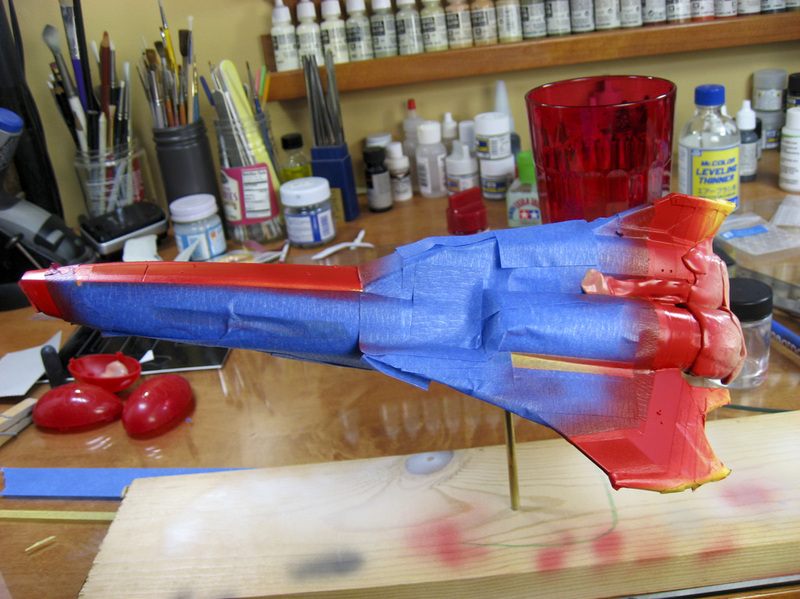 There’s some cleaning up to do where I built up the paint a little too much, but otherwise it looks good. 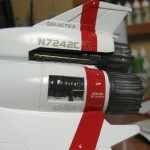 Next is weathering, and a final clear coat to hide that visible film around the decals. 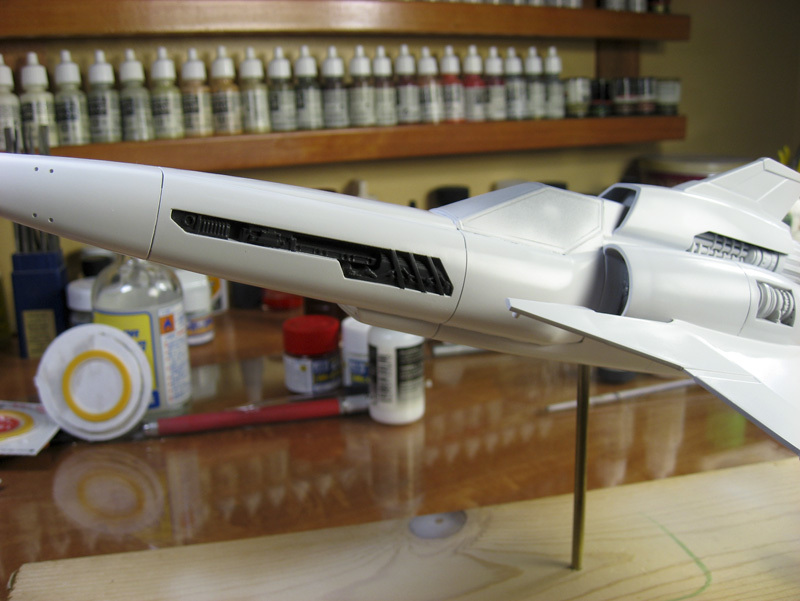 I have to say that I’m pretty impressed with how this model is turning out. I’ve had my doubts along the way, but she’s coming together very nicely! 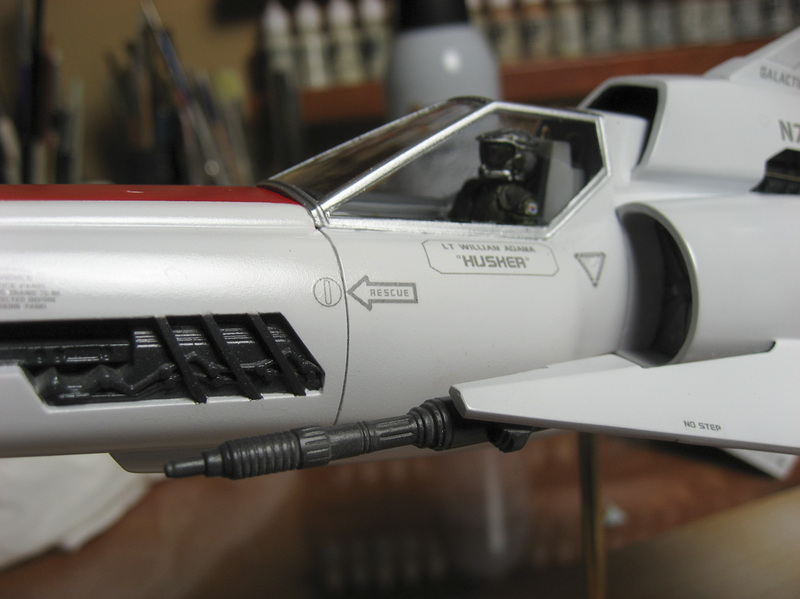 First Viper in-progress post in a while. Two weeks in Hawaii and the subsequent jet lag cut way down on building time. 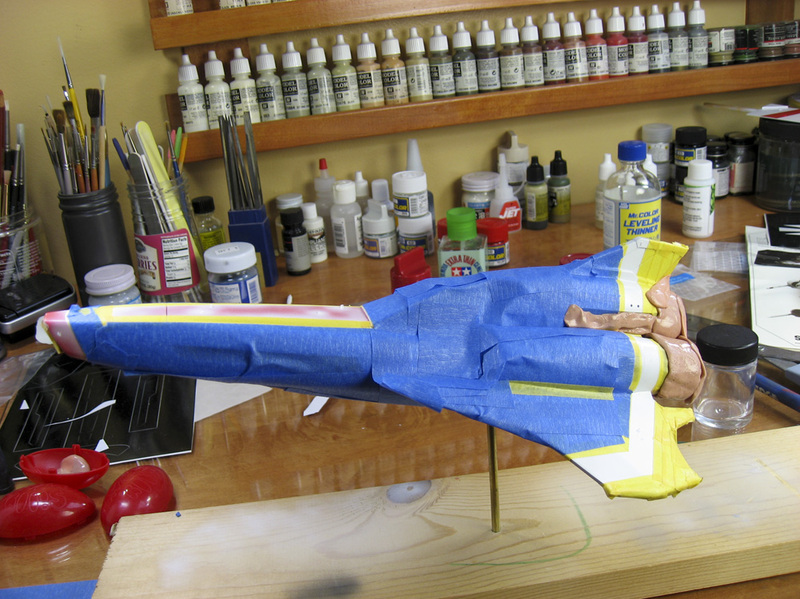 Also, I’m nearing the end of the project, and that’s another time when things seem to slow down. 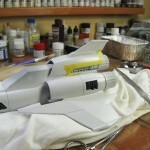 Last minute tweaks, touch-ups, details, etc, all add very little to the overall bulk of the model, but they take a lot of time and do add those little touches that make a model into a replica. Only two real photos this update. 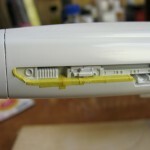 The first shows the added piping that I’ve done to the engine bays. The top is brass rod, the lower two are braided steel cable. 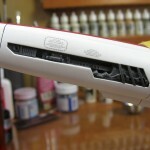 The cables come in a roll and are plastic sheathed, which kind of kills the whole braided look. So I held them over a flame, burned off the sheathing, tacked the ends with superglue so they won’t unravel, and glued them in place. 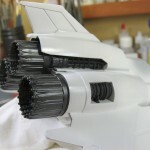 I was going to leave them in natural metal, but the more I look at it the more I think I’ll be painting these details. 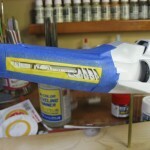 The guns were a lot of work for one-piece fixtures. 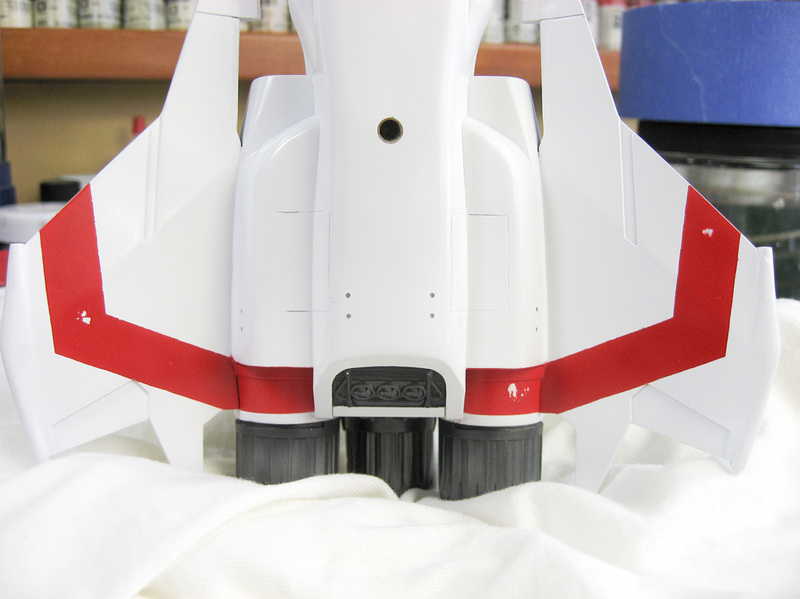 There were seams around the entire assembly, and anytime you have to sand anything rounded and with a lot of detail, it takes a lot of effort. 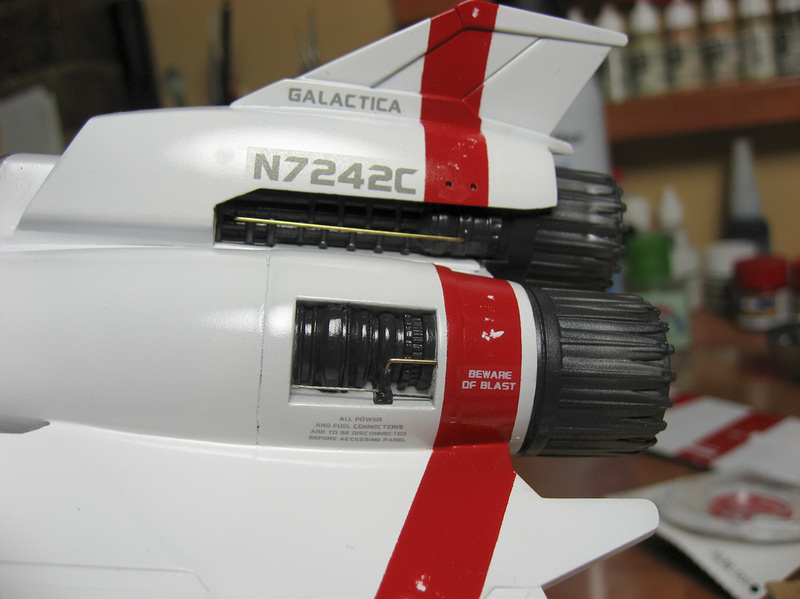 I believe I spent three evenings of work just to get these things looking right. 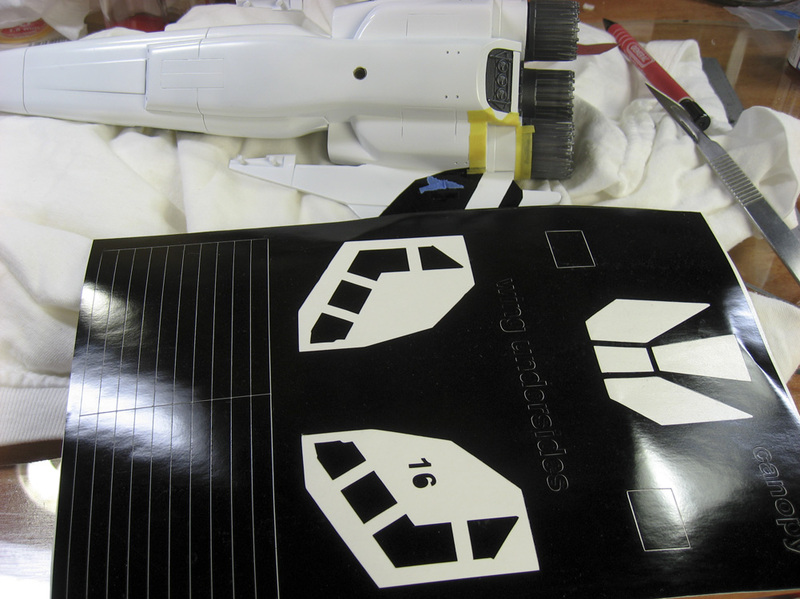 Up next: Decals. This weekend. 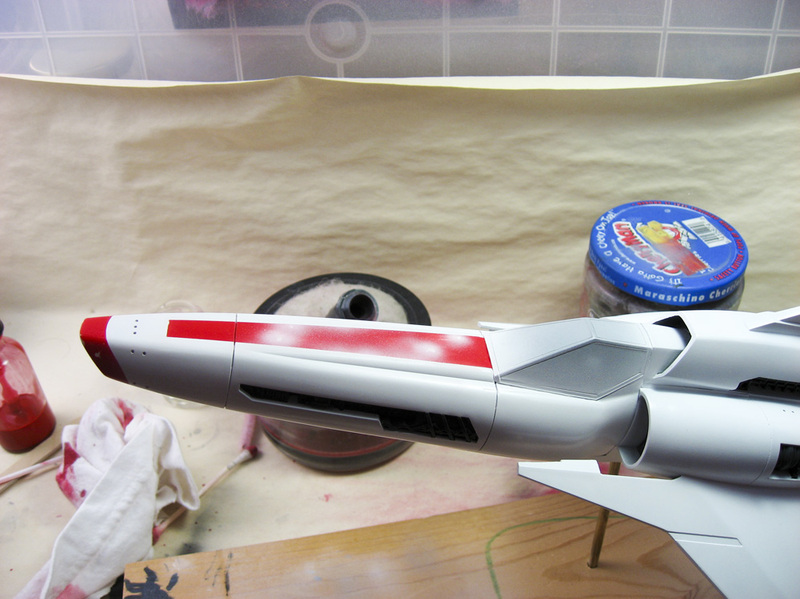 I went through the process of masking everything again and shooting the new shade of red. 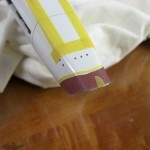 A few photos of that masking and painting process. 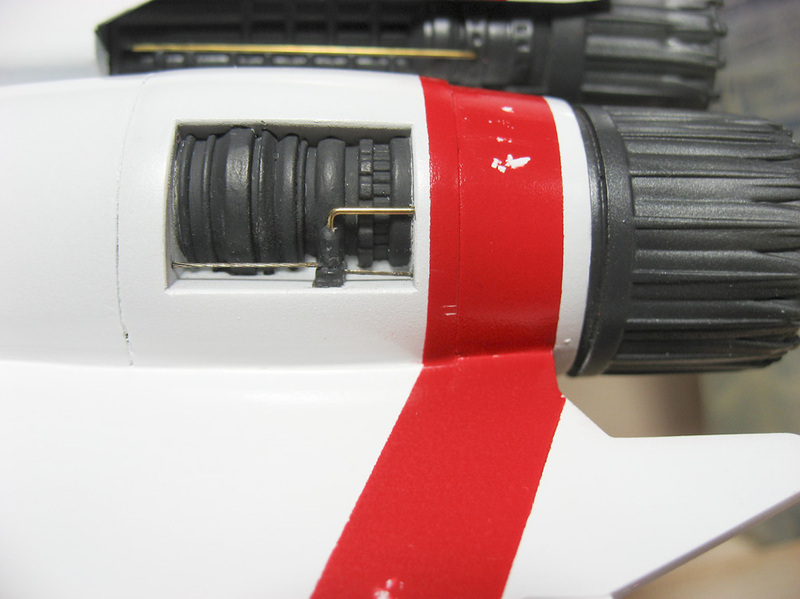 I did the masking with Tamiya tape completely this time, choosing to not use the vinyl masks due to the problems I had with them on the first pass. 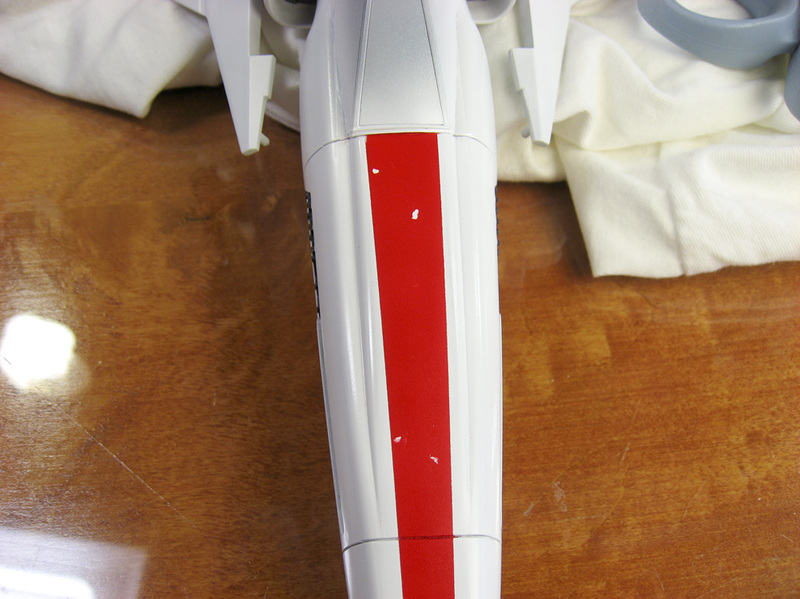 There was a little overspray here and there, but nothing major. I’ve already polished most of it out with rubbing compound (using sandpaper on the red/white combination causes the red paint to stain the white, but the compound does not have this problem. Who know why…). 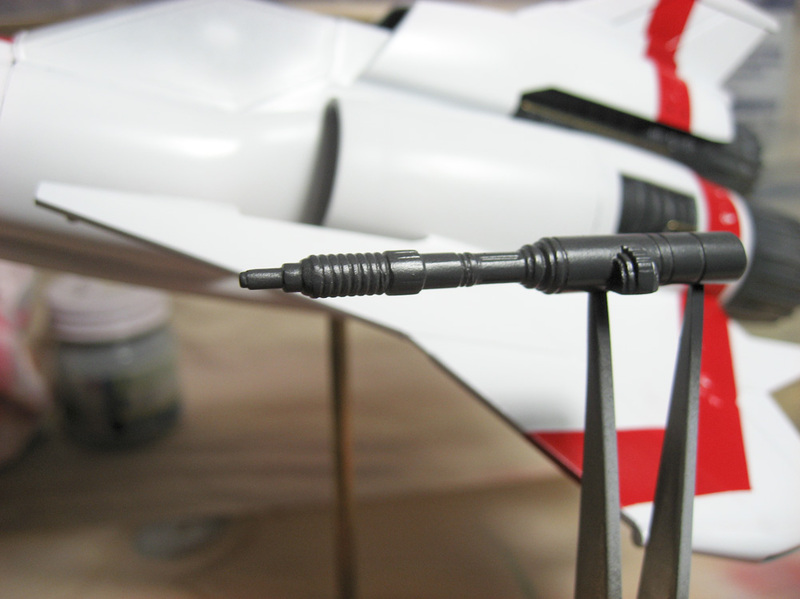 Finally, I’ve started the plumbing of the engines. I’m using brass wire, which I’ll leave mostly unpainted. They’ll be weathered to blend in with their surroundings, but I like the natural metal look. 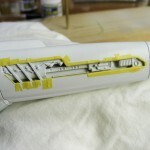 I’ve also primed the guns and am ready to paint them after a little more cleanup. 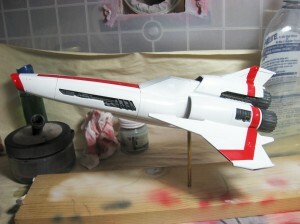 Once the piping is done, the guns are mounted, I need to do decals and paint the canopy frames, and she’ll be done! “If you spend two weeks trying to convince yourself that something is correct, then it probably isn’t.” I’m not sure if anyone has ever said that (if not, then (C) Devin Poore, 2012!) but it’s appropriate for my recent experience with the Viper. 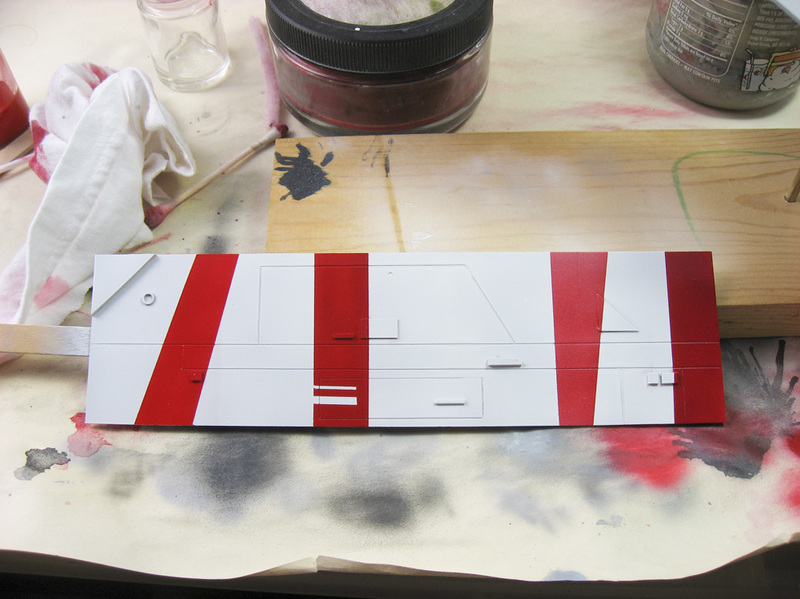 I kept telling myself that the shade of red mentioned in the last post was fine, that I’d be able to tweak it with clear coats, glazes, and weathering, but the truth was that I just couldn’t take that next step to mask off and paint the rest of the stripes. So I did some testing. 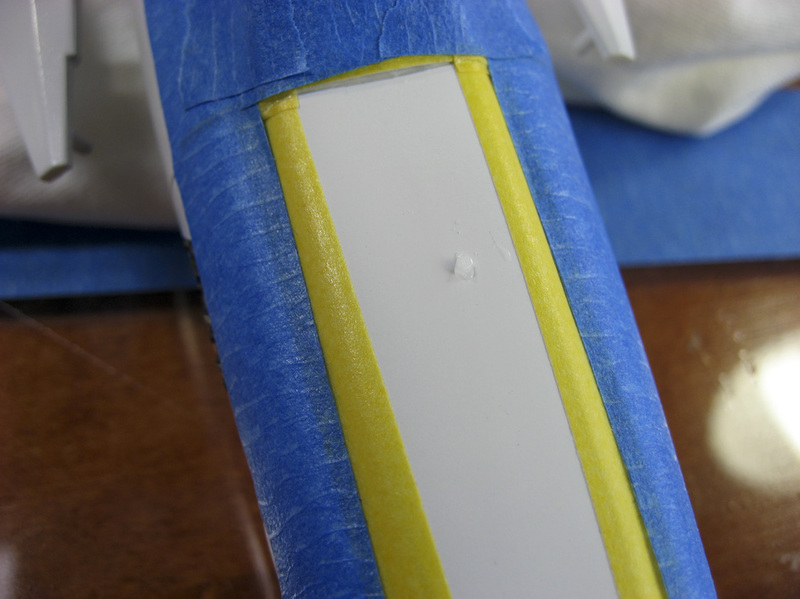 The two photos below are of a sheet of styrene that I used for swatches. 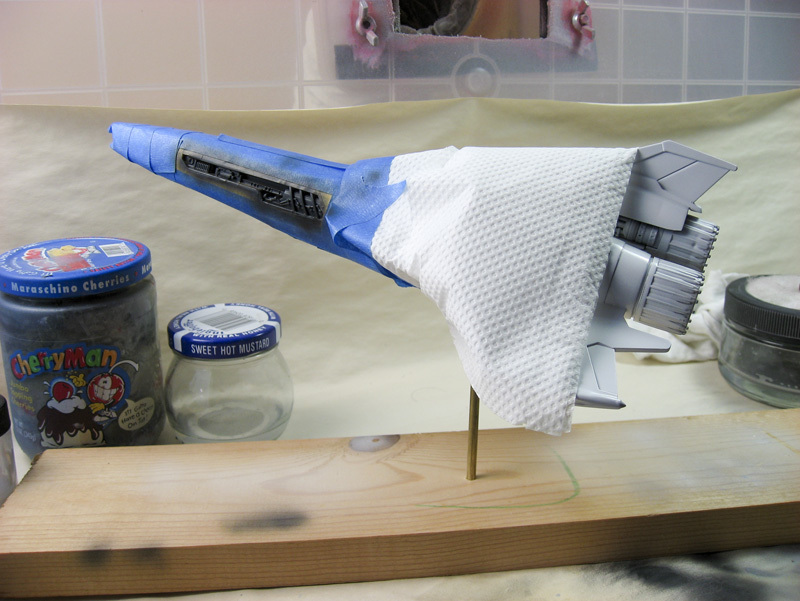 I made this up months ago to test paints for an X-Wing paint job (hence the scribing and added bits of styrene detail), but it worked well for this purpose. I painted four shades of red on the test sheet, and compared them to photos online, and to what I think looks right. 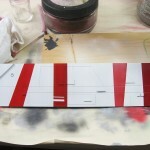 The first photo is of all four stripes. 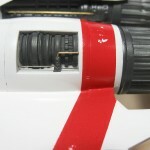 The second photo has the current red that I used on the left, and the new Insignia Red stripe on the right. 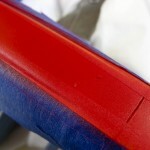 It’s not a huge difference, but it’s there: the Insignia Red is just a tad darker, and more importantly, it has more of a blue hue to it than the original color. This is what I’ve sought. 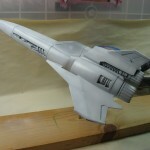 I’ve started prepping the Viper for repainting (first photo in this post). 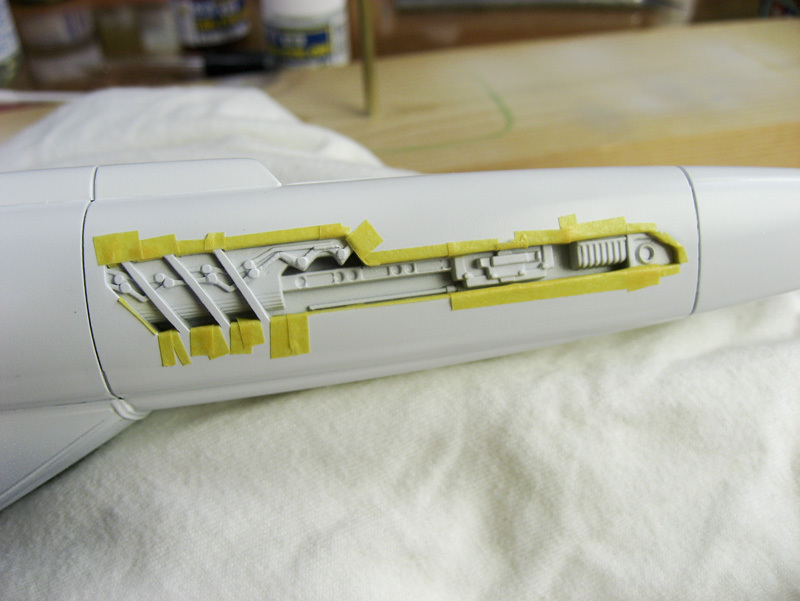 Fortunately this doesn’t require a stripping of any paint. 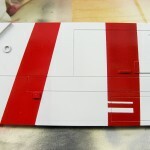 I wet-sanded the borders of the existing stripes so there is no raised buildup that will show after the new red is laid in. 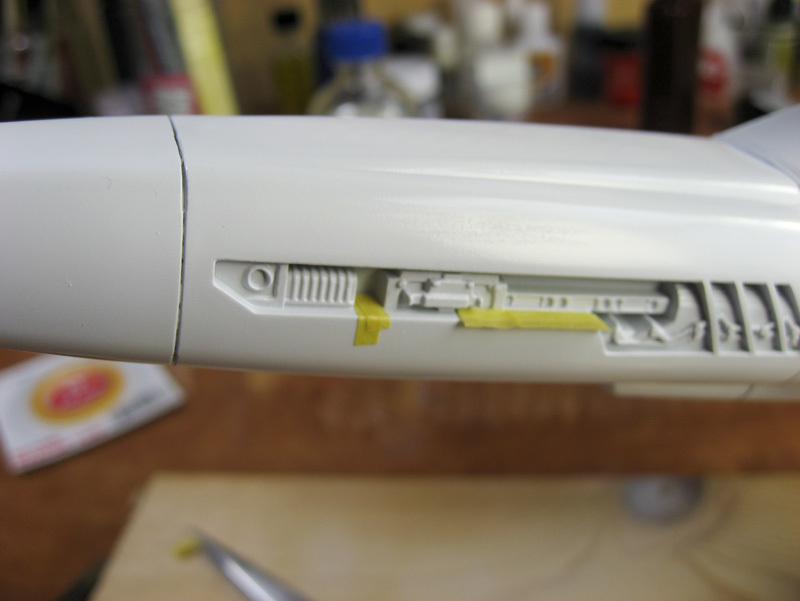 I went over the chipped paint areas with more white, very thinned, very low airbrush pressure, to give me more wiggle-room when re-applying the salt chips. 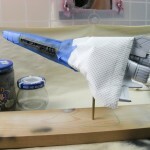 I’ll let the white dry for most of the day, and then start the masking again. The Viper model kit comes with an extensive decal sheet, which included all of the red striping that dominate this craft. I, however, am using the Aztek Dummy masks. 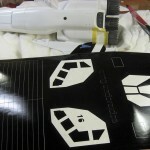 In the first photo below you see the sheet the masks come from, with the odd angled pieces already removed – the black vinyl is the mask, the visible white is the backing. 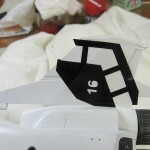 The next photo shows it on top of the wing. 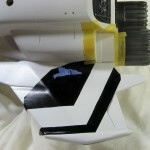 Those black strips/bars that connect the two sides of the mask are there to aid in placement. After placement you take a straight-edge and a knife and cut them free. 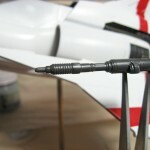 In my opinion this causes a major problem, which is why I started by trying these out on the lower wing surfaces first. 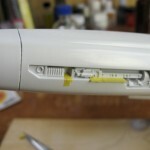 By cutting the reinforcing strips out after putting them on the model, you are cutting a small groove into the wing’s surface. 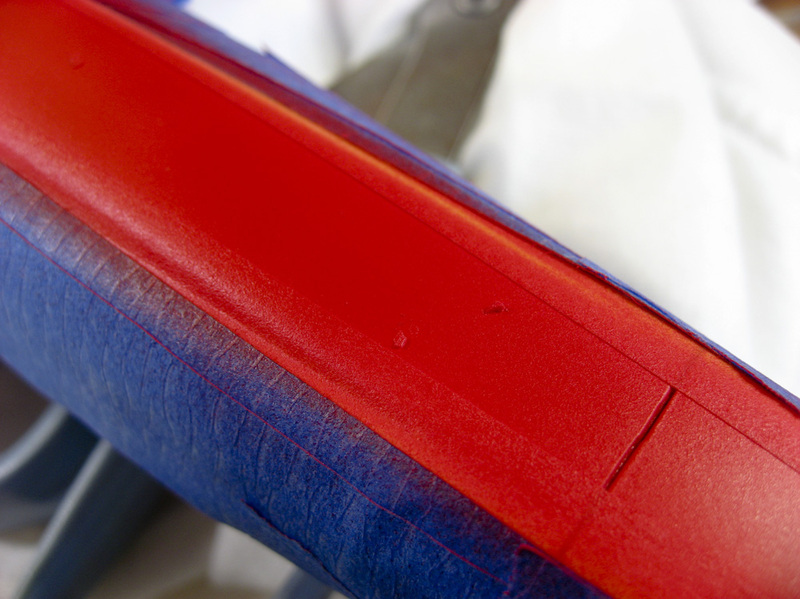 Also, you have to be precise, very precise, to make sure that cut is exactly along the edge or you get a recess or protrusion in your straight-line mask. 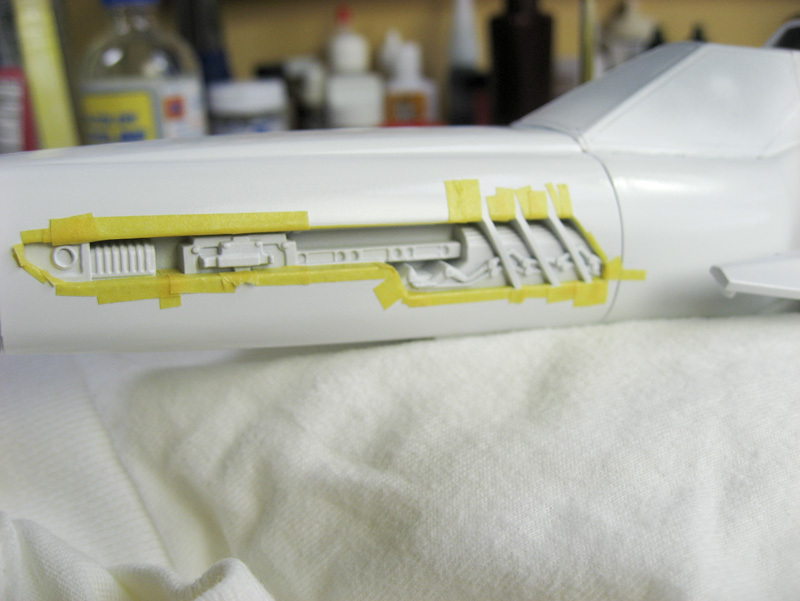 I ran into issues with all of this, and while the result is okay, the cuts where I removed the reinforcements pulled paint into them causing artifacts in the finish (and I cut the reinforcements out with a brand new, super sharp, scalpel blade). 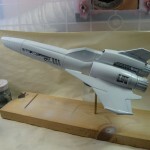 In the final photo of this set you can see the end result. They look okay in the photo, but up close there’s too much inconsistency for my liking. 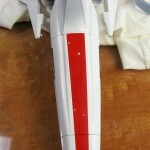 The large white chips in the red are intentional, more on how I do those in a moment. 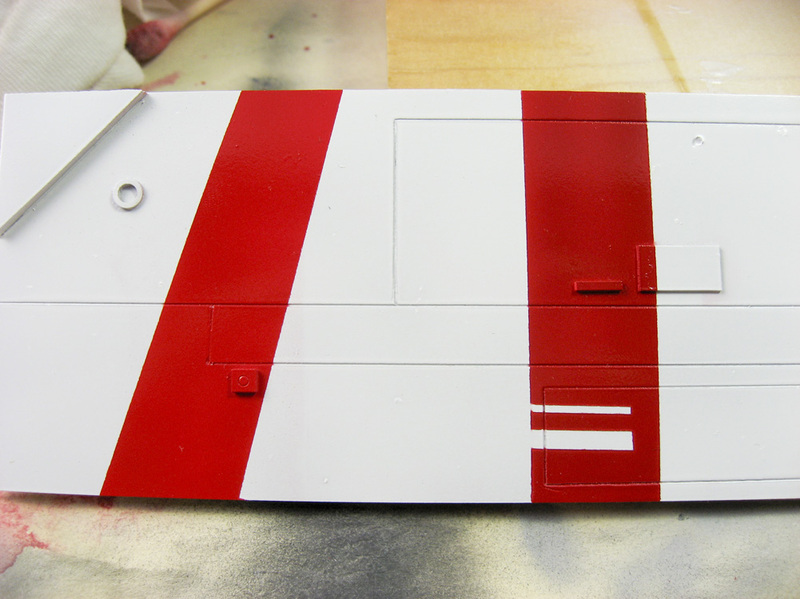 I decided to skip the vinyl masks and go old-school on the nose stripes. 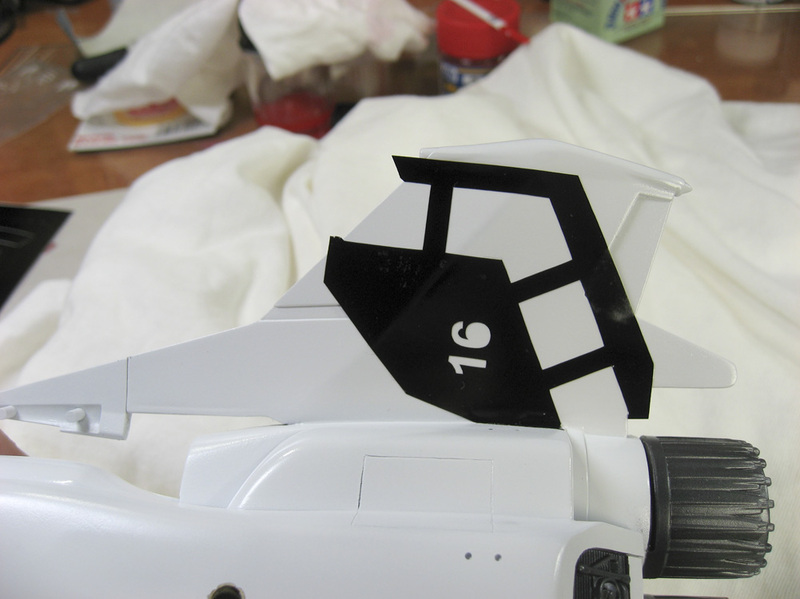 I made a color copy of the decal sheet, cut the stripes out, and tacked them onto the model with tape. 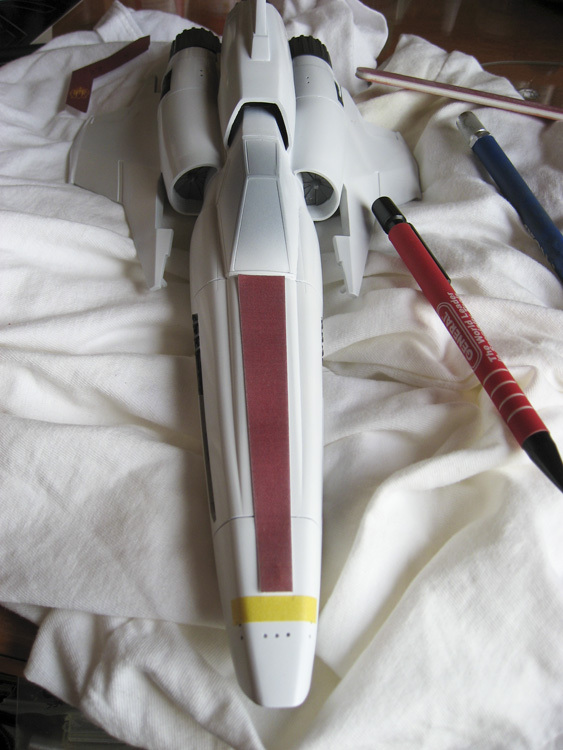 I then outlined the stripes with 6mm wide Tamiya tape for the upper stripe, and I used extra-fine 1mm wide Aizu brand tape to mask the curve around the nose. Once the stripes were masked, I prepared a small dish of water and another dish of Kosher salt. 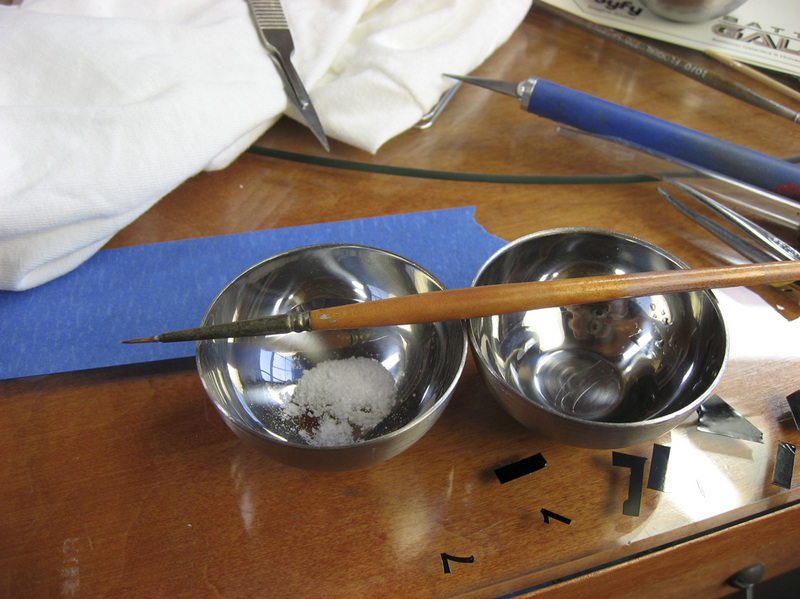 Kosher salt has much more random and natural crystals than table salt, which makes it better for this application. 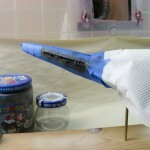 Take a paint brush, put a single drop of water on the model where you want a chip. 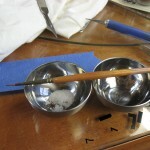 Wipe the brush on a cloth until it’s nearly completely dry, then dip it into the salt and pick up a few crystals. Put the salt on the drop of water on the model. 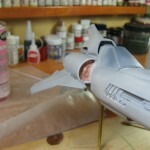 As the water evaporates the salt dissolves just enough to adhere to the paint. 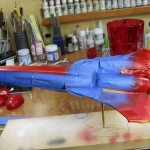 Let it dry completely — usually only five or ten minutes — then spray your paint. 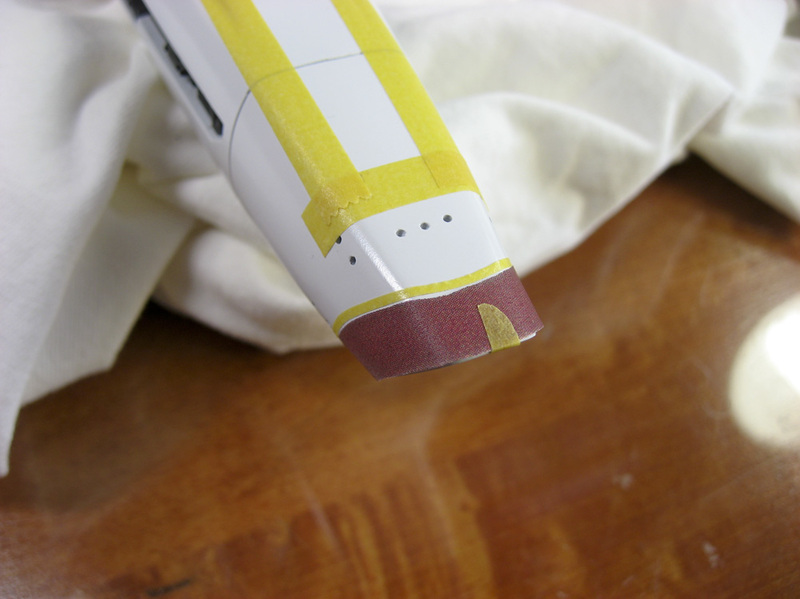 After you remove all of the masking, take a toothpick and gently knock the salt free. 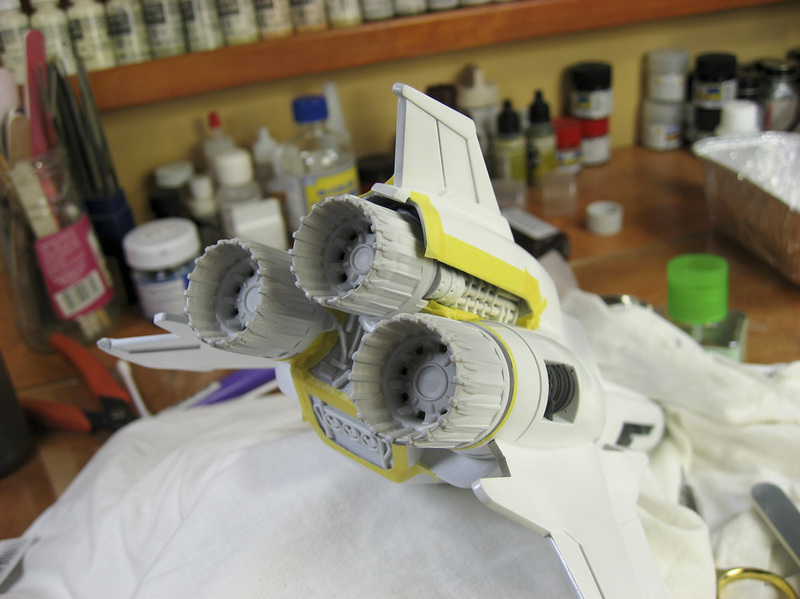 Instant jagged paint chips. 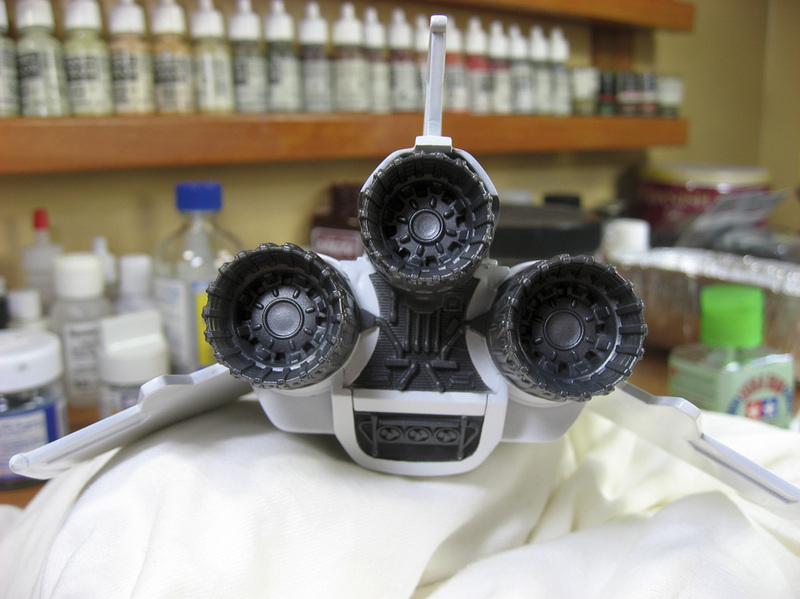 I’m going very light with this effect on this model, but I do like the results so far. For the red color I’m using Mr. Color #68 “Red Madder” and I’m not entirely sold on it’s accuracy. It’s better than their #3 plain-ol’ “Red” in matching the decals, but it’s still a little bright for my tastes (and in the photos it’s much brighter than in person). 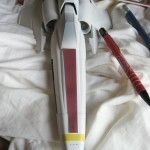 Nothing that some weathering won’t tone down, though. 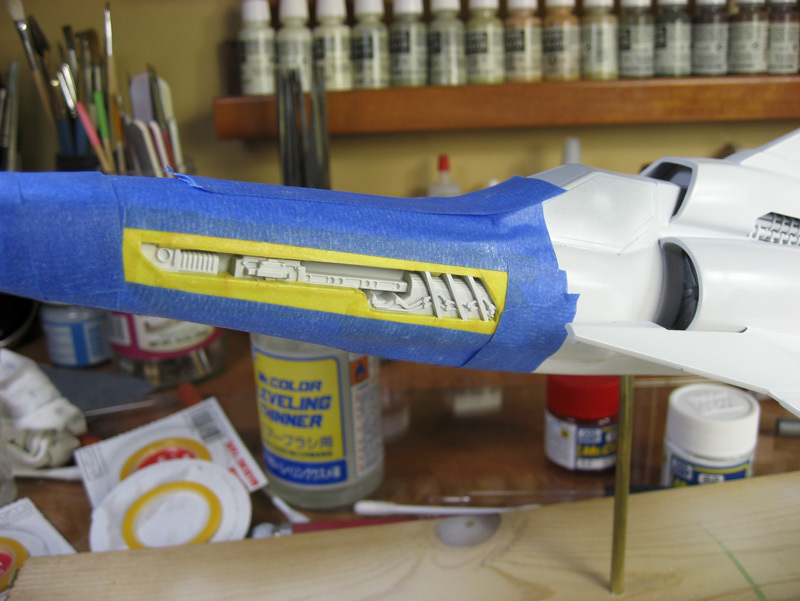 For the stripes on the wing upper surfaces I’ll be skipping the pre-cut masks and just cut them in on my own with masking tape. 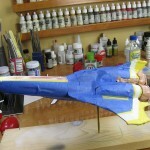 I hope to have that done by the end of next weekend. 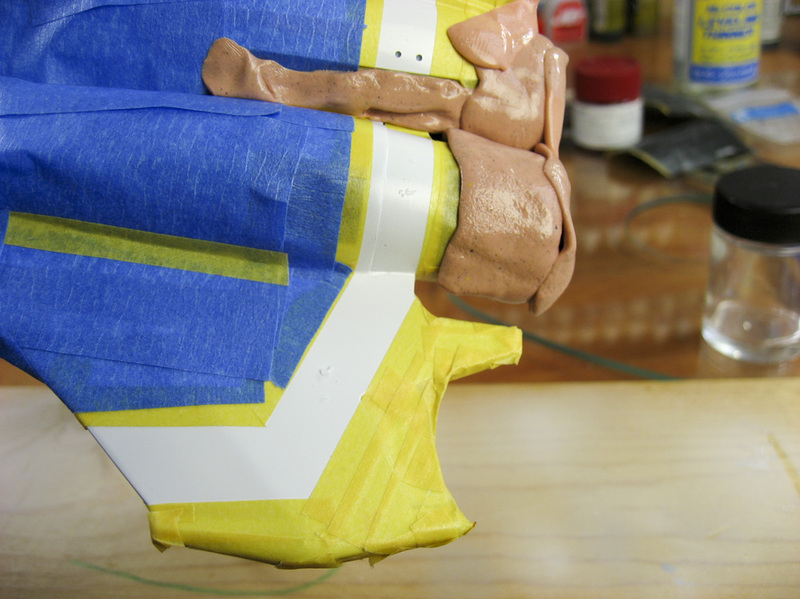 Okay, it’s probably boring as hell looking at all of the taping I’m doing. This is more for me, anyway, so I can look back and see how nuts I was to do all of this. 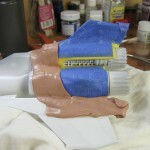 More of the same as last post, making tape all over the place, Silly Putty and paper towels to seal it all off. 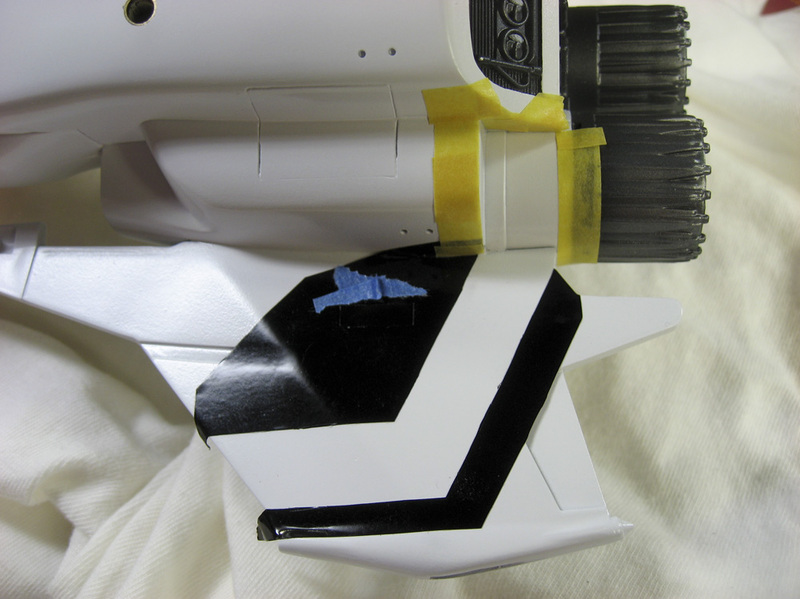 In this case, literally 3 hours and 15 minutes of masking, less than 5 minutes of painting, then 10 minutes to rip it all off. 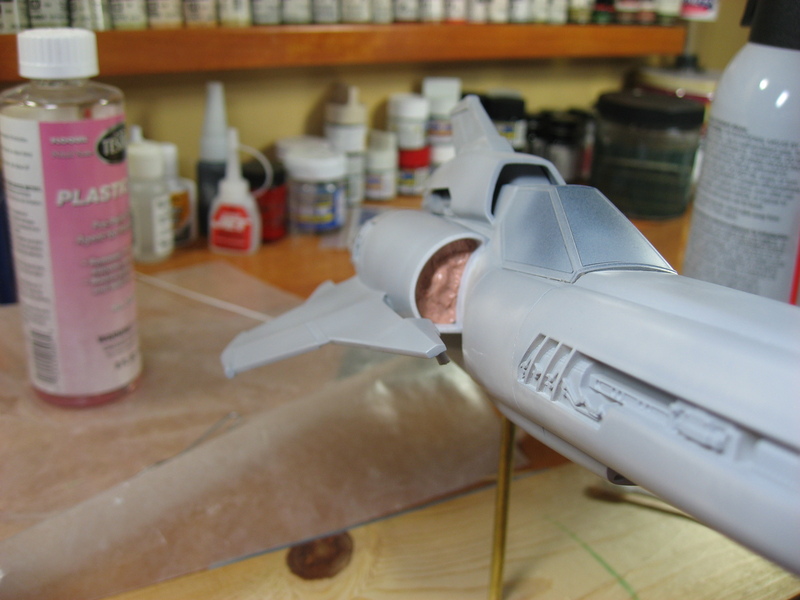 Engine inset, thruster cans, and intake above the cockpit are all done in dark gray. 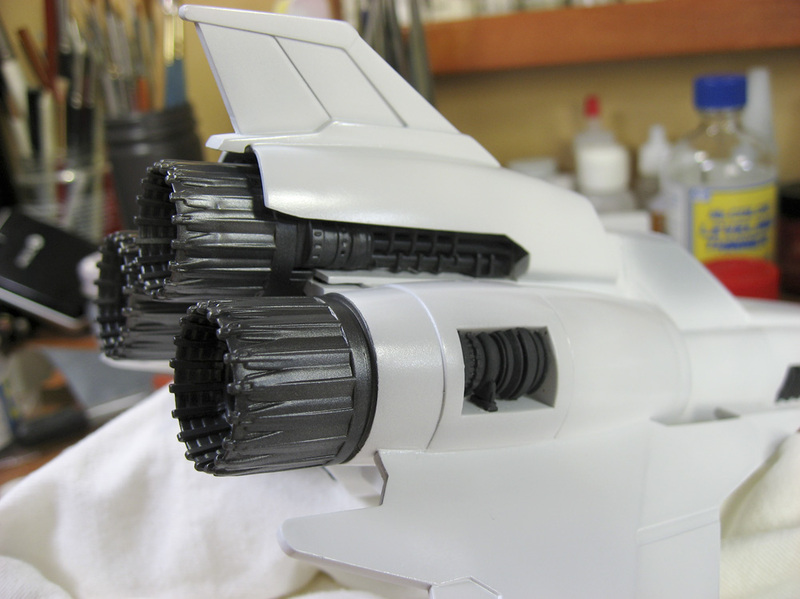 I used some Alcad metallic Magnesium to give some highlights to the thruster cans (can’t really see it in the photos) and to paint the inside of the nose opening. I’m particularly proud and pleased with the third and sixth photos in the gallery below. 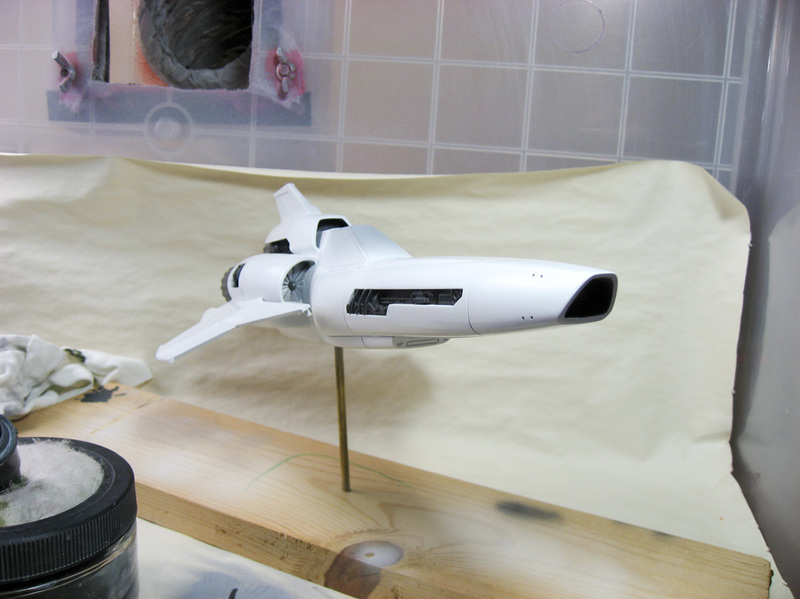 The full-scale filming model has this entire area in dark gray, but some of the CGI models and some smaller scale builds have it masked off as I’ve done. 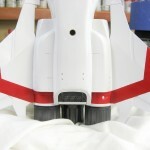 The third photo shows the massive amount of masking, the sixth shows the result. I couldn’t believe how well it turned out. 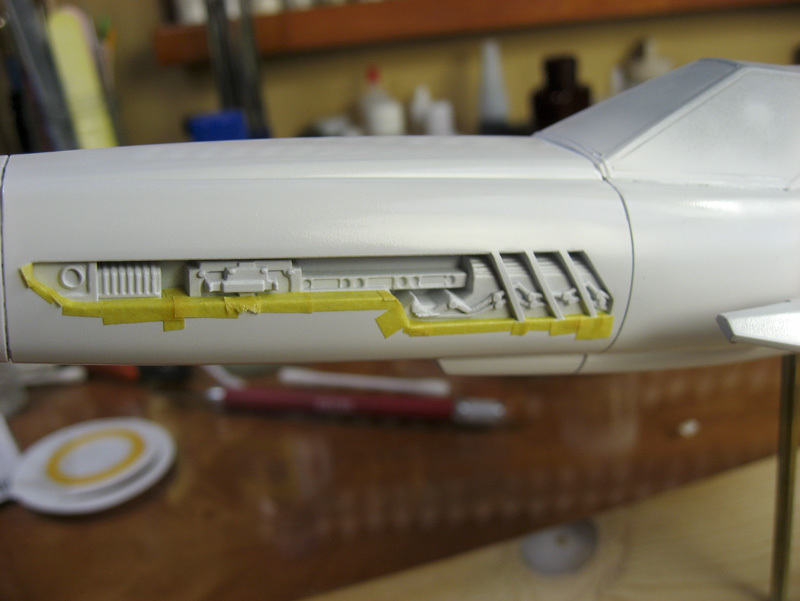 Now that all of the white is in, I decided to go with the avionics bays and engines for the next part of the process. 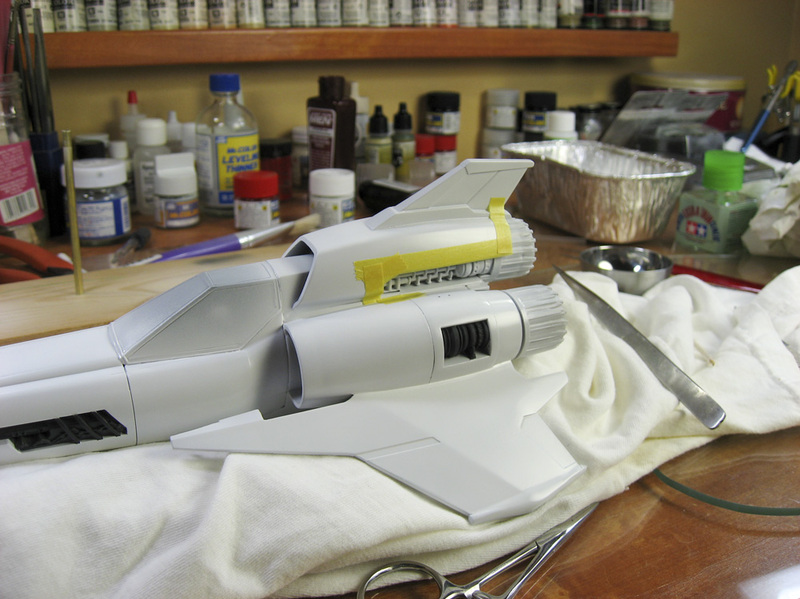 It’s a small and seemingly insignificant part of the project, but it takes a lot of work to get it painted. 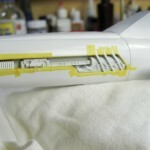 Below are images showing the tedious process of masking. 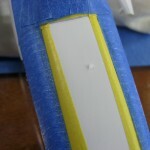 The tape is at most 4mm wide, cut into even smaller strips so that they’ll fit where needed. 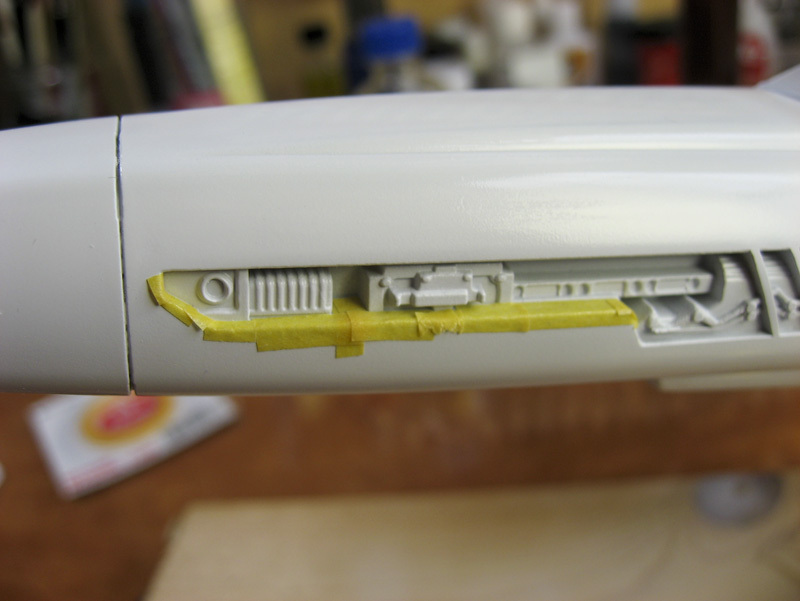 I’d say that each bay took me about 45 minutes to completely mask. 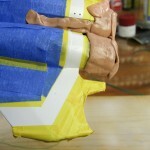 Then it was literally two minutes to spray the paint, and then another two minutes to remove the tape. 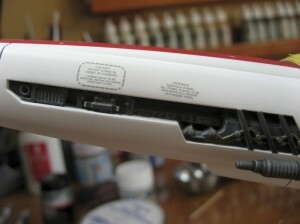 The end result is very clean and worth the effort, but the color is a bit dark to my eye. 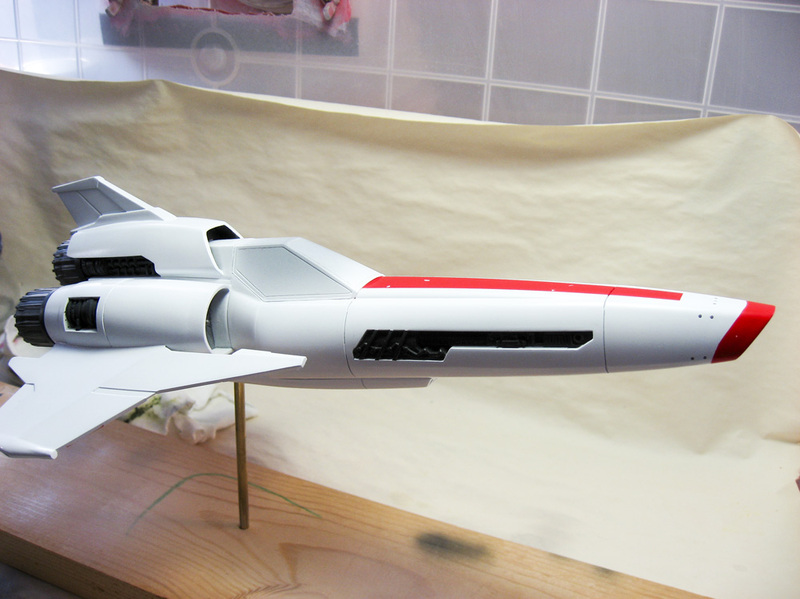 I’m going to leave it as-is until the engines are done and the stripes and guns are added. 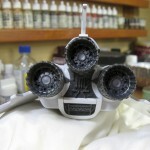 If they still look too dark then, I’ll lighten them with some light gray glazes and washes. 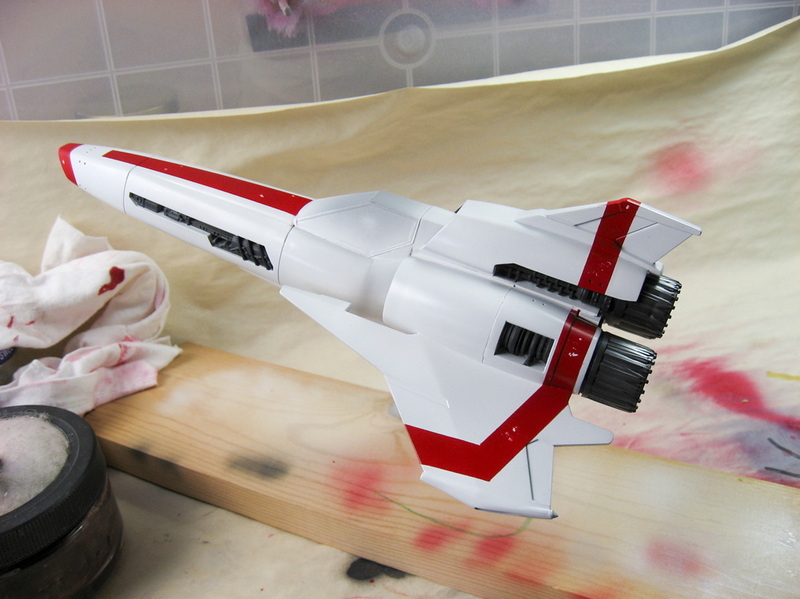 Vipers are white, which poses a special problem in that white is one of the absolute worst colors to have to work with. 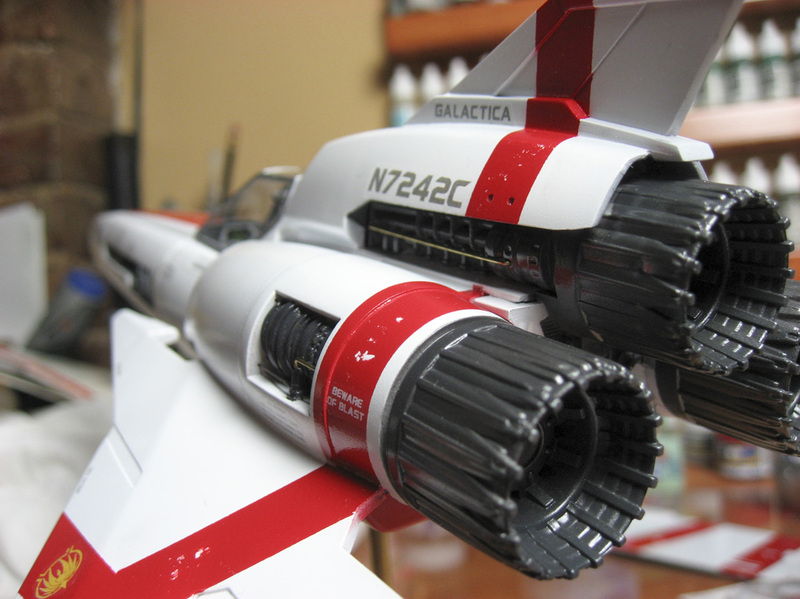 Some will say it’s replicating a bare metal finish that’s the most difficult, but I’d rather paint a dozen aluminum and tin and steel clad aircraft than just one in white. 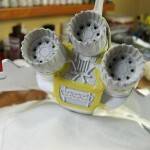 I started off the process by covering the already painted engine intakes with Silly Putty. 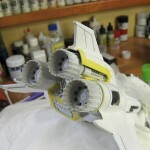 Then it was time to mix up the paint. 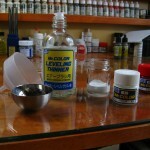 Here I’m using the lacquer based Mr. Color gloss white. 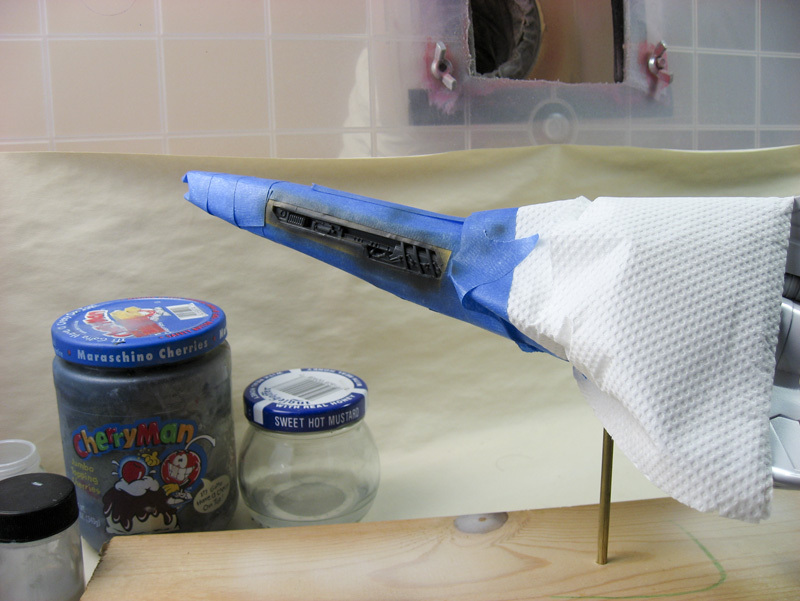 I prefer acrylics for most everything except priming, but since white is so troublesome, I wanted something that would dry fast and stick like glue immediately; acrylics dry fast but can sometimes take days until they’re ready to sand/feather or mask over. 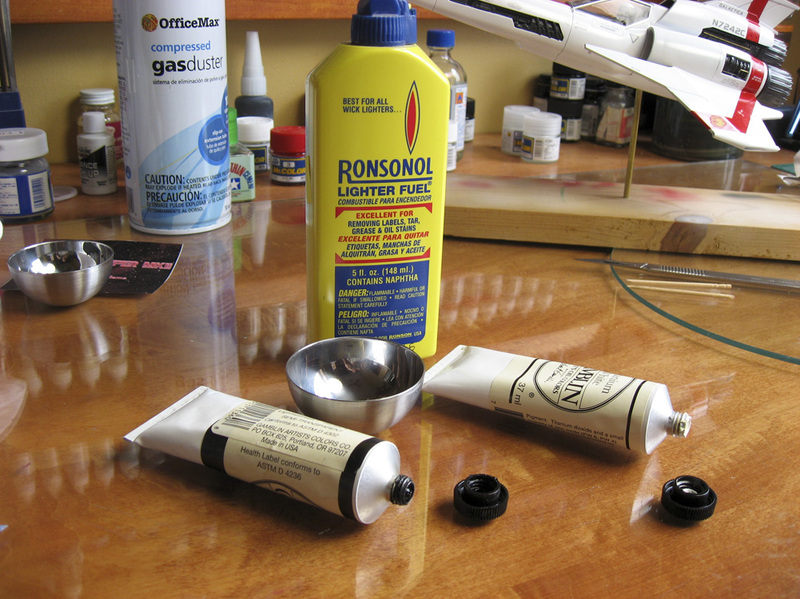 The obvious issue with lacquer as opposed to acrylics is that they are about as toxic as standing water in an abandoned Jersey City lot, but they do spray and work beautifully. 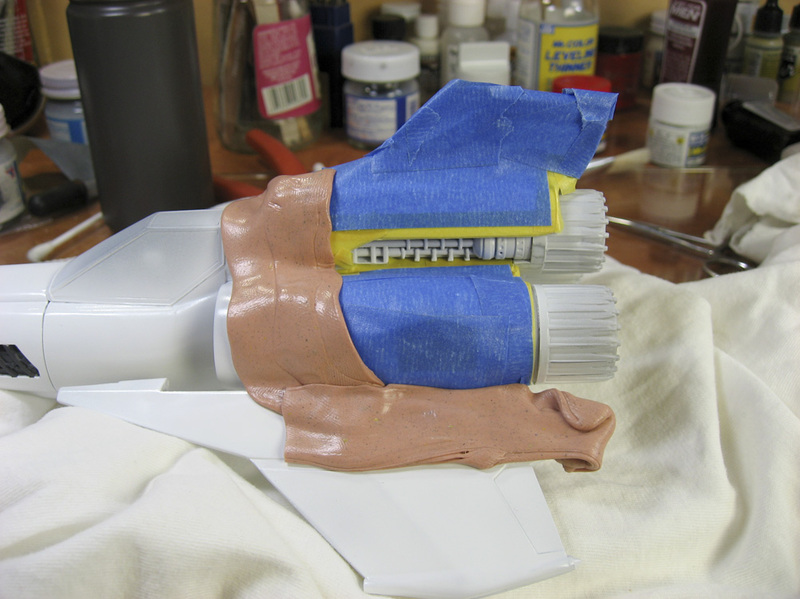 I did an initial coat of the stuff that I’d thinned a bit too much. It went on translucent, so I made the best of it and got as much coverage as I could. 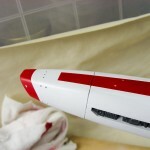 There were a few imperfections that I’d missed, and the ever-present dust particles that stick in the paint no matter how well I clean the area, that I had to take care of. Fortunately the paint was dry enough to sand in a couple of hours. 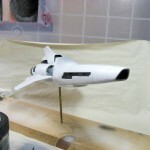 The next painting session went better, and I’ve got a good overall coat of white now. 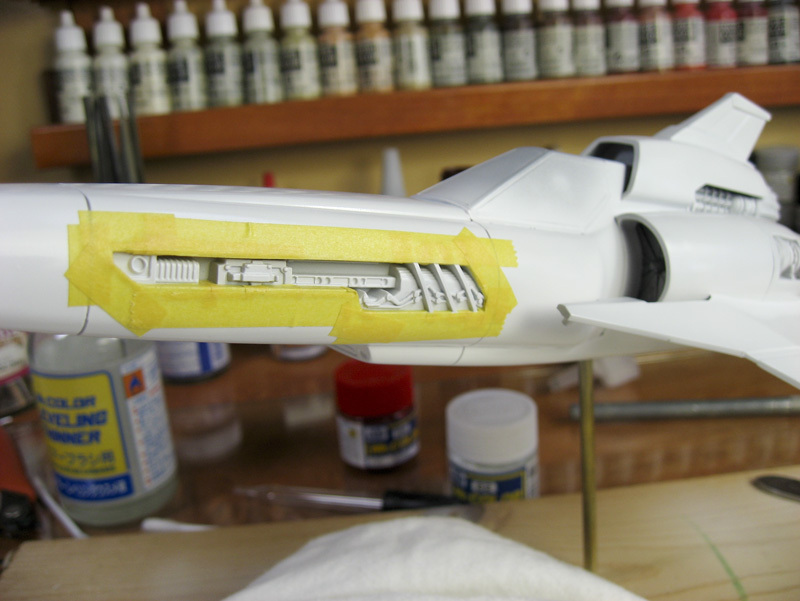 There are a few places where dust needs to be polished out, and a spot of rough paint below the canopy where the surface is grainy — from not getting a wet enough application — but I’m hoping that I can work these areas and not get back down to primer and need to spray them again. If that’s the case then the next stop is either masking and spraying the red stripes, or making the engines and other bays for dark gray paint. I haven’t decided which to do next. The end is (almost!) in sight.